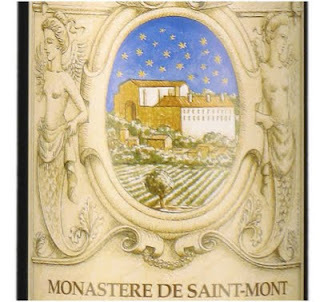 The label accentuates the history and rarity of this wine with a drawing of the 11th century Monastery of Saint Mont, under a deep blue starry sky. The village of Saint-Mont dominates the Ardour Valley. Raymond de Saint-Mont founded a monastery here in the 11th century that later became part of the order of Cluny. A number of documents testify that the Benedictine Monks worked the vines and made wines that were transported in barrels on the Adour River and exported to Holland and the United Kingdom from the 14th to the 15th century. On pouring, the wine reveals a deep purple hue and a deep pungent nose, aromas of jammy fruit, leather and elegant oak. It has a lush roundness with flavours of red stone and berry fruits with excellent tannins that enhance the finish. The French Guide Hachette has awarded a “Coup de Coeur” for previous vintages. The 2009 Guide Hachette describes this wine as having “great complexity of aroma and flavours”, “one crafted with great skill that will repay keeping for two or three years”. The complex and intense flavours of the Château St Go reflect its ageing in 225 litre oak barrels for 12 months in a dark cellar. The wine is a dark purple/red almost black colour with an aroma of blackberry and roasted notes. These flavours continue on the palate with a full and rich structure. The ripe tannins reveal the ageing potential of the wine. A rich wine with a purplish colour. Stone fruits and roasted cocoa bean aromas are on the nose. The palate is full and rich, with roundness and structure and a long toasty finish. The perfect accompaniment to red grilled meats, game and cheese. A blend from late harvest grapes picked on or around November 15 – St Albert’s Day. The grapes are placed in small wooden crates in order to preserve the quality of the grapes during transport. The wine has a bright straw colour. The nose offers a complex aroma of fruits (quince and citrus) with vanilla, hints of cocoa and ripened grapes. The palate seduces with flavour, balance and an absence of cloying sweetness. The St Albert can be served as an aperitif, especially with a sheep’s milk cheese from the Pyrenees. It is also beautiful with fruit or cream based desserts.